After the coffee break on Thursday June 28 Dr. Peter Schisler was talking about “Film/TV production in Second Life – business models?” and reporting about a TV station in Second Life, which is a project of the Institut für digitale Kommunikation. Interestingly the virtuality of most program scenarios allowed for much cheaper production costs. After Dr. Schisler Prof. Thomas Bremer FHTW Berlin, (Professor for media concepts, emphasis on interaction design, interactive simulations, game and character development) was talking about “Serious Games and cultural context“. He explained the term “Serious game” as part of a play theory and in particular Role-playing game theory (not to be confused with game theory). Serious games – in contrast to usual games – have the intention to give the player the opportunity to learn something. So they are part of educational games. However in contrast to direct educational games like e.g. daytars radonge or ToPong Thomas Bremer wanted to put emphasis more on the fact that serious games may allow the player to immerse in a “different world” in the sense of Johan Huizinga’s Homo Ludens. Thomas Bremer recalled a few main points which characterize games: “Game is free will action”, not “real or actual life”, “spatial and temporal closure”, often “replayable”, “enchantment, challenge, suspense”, “games need rules”. In his investigation of existing serious computer games he found that most serious games are in military operations, medical education and emergency management training. After recalling the wellknown “immersive games” (or environments) Civilization, WoW, Second Life he named and described the military related games Americas army, Armed assault (by Bohemia interactive) and Virtual Battlespace 2. The games Food Force United Nations, Darfur is dying (review) and palestine/peacemaker (review) by peacemakergame.com are also political games but concentrate on peacemaking by virtue of nonmilitary means. Thomas Bremer furthermore listed the game Hazmat Hotzone which is a Firefighter training, the Tactical language and Culture Training system (Computer-based learning system that lets people quickly acquire functional knowledge of foreign languages and cultures), the game Wolf Quest (“join a wolf pack and hunt, fight, and socialize, all while doing your best to survive.”). He finally mentioned that there are medical games as a virtual reality therapy for spider- and acrophobia and the Interactive Trauma Trainer by TruSim (Blitz games England, under subcontract of Human Factors Integration Defence Technology Centre, lockheedmartin*). *(by the way the site hosts an interesting reading namely the frontline edition about serious games, including a short history of serious games). And indeed – coming back to the pioneering game Ökolopoly one should remark at this point that with the advancing computer technology it is suggestive to assume that not only the climate predictions got more precise (and such more urgent!) since the eighties, but that also computer games may find more ways to delve into future scenarios. After Thomas Bremer, filmmaker and author Peter Krieg gave a talk on “From sneaker net to Joost: The Long March of interactive TV” where he discussed in particular the role of public TV and radio stations. After the talk there was a discussion about IPTV and DVB, which I skipped. I also skipped the morning sessions of the next day which focussed on juridicial aspects of new media and went straight away to filmmaker Dr. Viola Stephan‘s talk: “Everything in high resolution, impacts and implications of high definition (HD)“. In the talk she explained at the example of her films how the new digital high definition technology changed her way of working and how the works are differently perceived. For example the different depth of field possibilities with digital techologies lead to a completely new readability of images. Likewise the new film formats and in particular the new aspect ratios change film making in a quite dramatic way. She remarked that the e.g. 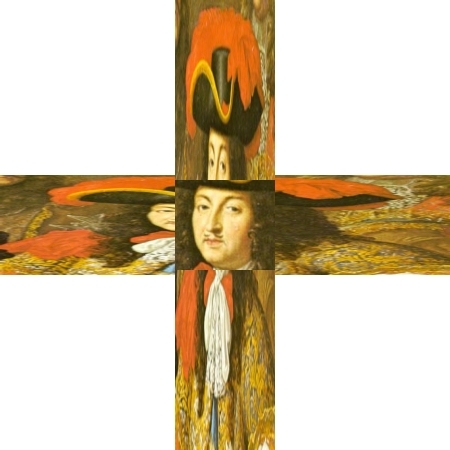 the tendency to change the aspect ratio more and more into a landscape format (“tendency for the horizontal”) makes it difficult to make close ups of single faces, which need a vertical format (see artwork below). So modern images of faces include either more than one face (like e.g. the news are done nowadays usually with more than one speaker) or they contain a “cut face”. She was asking herself also wether this “tendency for the horizontal” has something to do with societal changes, since the images of eastern icons are almost all in a “vertical format” – even the western altars usually have diptychs or triptychs. She cited the example of a ucrainian icon painter who wanted to make an icon in a horizontal format and basically found only an entombment as an appropriate sujet. After Viola Stephan Jörn Töpper of IWM spoke about “Convergences of Film and Computer and the learning potential of new media“. After that Dr. Jasminko Novak of Univ. Zürich and the European Institute for Participatory Media, Berlin spoke about “User-centric media and next generation media ecosystems” which provided a structured overview over the topics which were adressed at the NMI conference.